A number of fatty acids (FAs), such as omega-3, omega-6 and conjugated linoleic acid (CLA), which are present in the milk from dairy cows are considered essential FAs and beneficial nutrients for humans. The aim of the study was to compare the milk FA content, particularly the CLA, omega-3 and omega-6 FA content of the milk fat of Jersey and Fleckvieh x Jersey (F x J) cows in a pasture-based feeding system. All cows were fed the same diet consisting of kikuyu-ryegrass pasture in a rotational grazing system supplemented with a standard commercial concentrate mixture at 7 kg per cow per day. Five milk samples were collected every five weeks from 10 days after calving, that is, days in milk (DIM) up to 175 DIM. In addition, two samples were collected every five weeks from 240 DIM to the end of the lactation period. Sampling was done at the evening and following morning's milking session and pooled for each cow. Samples were kept frozen at -20 °C until laboratory analysis by gas chromatography. Thirty six FAs were detected and concentration levels determined. Higher levels of total CLA (0.74 ± 0.02 vs. 0.63 ± 0.02 g FA/100 g fat), linoleic acid (1.51 ± 0.03 vs. 1.36 ± 0.04 g FA/100 g fat) and total omega-6 FAs (1.74 ± 0.04 vs. 1.54 ± 0.05 g FA/100 g fat) were recorded in the milk fat of F x J cows in comparison with Jersey cows, respectively. Increases in total CLA and the c9,t11 CLA isomers in the milk of Jersey and F x J cows followed the same trend, showing an increase from the beginning to the end of the lactation period. Similarly, the CLA content of the milk fat showed an increase with lactation stage for both breeds. Milk fat is often regarded as unhealthy owing to earlier research linking chronic diseases such as obesity, heart diseases and some forms of cancer to saturated fatty acids (SFAs) in humans (Salter, 2005). For this reason, fat free or low fat milk (0% or 2% fat, respectively) has become a popular choice among many consumers. Contrary to these negative claims, several studies increased the knowledge concerning the nutritional value and characteristics of milk, showing that it can be considered a multifunctional food product. Besides providing proteins, lipids, vitamins and minerals (Steinmetz et al., 1994; Atti et al., 2006; Collomb et al., 2008; Descalzo et al., 2012), recent research has shown that some milk fatty acids (FAs), particularly conjugated linoleic acid (CLA), have further beneficial effects on the health status of people by exhibiting anti-carcinogenic, anti-diabetic and anti-inflammatory benefits (Gavino et al., 1999: Khanal & Dhiman, 2004). The Jersey breed is popular among pasture-based dairy farmers, especially in the Southern Cape area of South Africa (Muller et al., 2008). Recently there has been increasing interest in South Africa in crossbreeding dairy cows, based on positive results obtained in the USA and Ireland using Montbéliarde and Norwegian Red breeds, relating to improved lifetime production of beef and milk yield, and reproduction (fertility, calving) performance in comparison with purebred Holsteins (Muller et al., 2008). The Fleckvieh is a dual purpose Simmental-derived breed from Germany with crossbreeding potential (Bayern-Genetik, 2012) to improve the lifetime performance of dairy cows in beef production, fat and protein yields and fertility (Bauman et al., 1999; Bauman et al., 2004; Muller et al., 2006). Furthermore, it appears that crossbreeding with Fleckvieh increases CLA levels in milk in comparison with Jersey cows on similar diets and management programmes (Berry, 2009). The aim of the study was to compare the milk FA composition, particularly omega-3 FA, omega-6 FA and CLA concentrations, of Jersey and Fleckvieh x Jersey (F x J) cows in a pasture-based feeding system. This study formed part of an ongoing crossbreeding study, using Fleckvieh sires on Jersey cows, that was conducted at Elsenburg Research Farm, Western Cape, South Africa, to compare the production performance of the two breeds. From February 2011 to June 2012, milk samples for FA analysis were collected from F x J and Jersey cows every five weeks, according to standard milk recording procedures. Milk samples were collected from 10 days after calving, that is, days in milk (DIM), to 175 DIM (milk recording tests 1 to 5) and then from 240 DIM (milk tests 7 to 8) to the end of lactation. For this study, milk tests 1 - 3 represent early lactation (<100 DIM), tests 4 - 5, mid lactation (100 - 200 DIM) and tests 7 - 8, late lactation (>200 DIM) (Samkova et al., 2012). Milk samples were collected at the evening and following morning's milking sessions and pooled for each cow. Aliquots from the milk samples were separated into two subsamples; that is, one for FA analysis (500 mL) and another subsample (40 mL), preserved with Bronopo-B2 preservative pills. These preserved milk samples were analysed for fat, protein, lactose, milk urea nitrogen and somatic cell count with the aid of a Milk-O Scan 133B at the Animal Production Institute's Dairy Laboratory, Agricultural Research Council, Elsenburg, as per standard milk recording analyses. Only the data recorded for fat were used in this study. All milk samples (n = 265 from 103 Jerseys and n = 302 from 92 F x J cows) were used to compare breeds for their milk FA content. Some cows were excluded from certain milk tests owing to illness or natural culling. Only cows with a minimum of three milk tests during the lactation period were included for sampling. Cows were on kikuyu-ryegrass pastures all day. They were supplemented twice a day with a pelleted concentrate mixture after the morning and afternoon milking sessions at 3.5 kg in the morning and 3.5 kg in the afternoon. It was expected that cows would consume approximately 10 - 12 kg dry matter of pasture per day. Milk samples were kept at -20 °C pending laboratory analyses. Milk FA composition and CLA concentration of milk samples were analysed by gas chromatography (GC) at the Institute of Biomedical and Microbial Biotechnology (Cape Peninsula University of Technology, Bellville) in Western Cape, South Africa. Separation of milk fat was based on the method described by Chouinard et al. (1999). Milk (500 mL) stored at -20 °C was thawed at 36 - 38 °C and homogenized using a polytron. An aliquot of homogenized milk (40 mL) was centrifuged at 4000 g for 30 minutes at 8 °C and the top fat layer (fat cake) was removed. The lipid from the isolated fat cake was extracted based on the method of Hara & Radin (1978) with hexane/isopropanol (3 : 2, v/v) containing butylated hydroxytoluene (0.01%) as antioxidant. A C17:0 triglyceride was added (100 μL/15 mg) to the fat cake prior to lipid extraction as internal standard. Saturated sodium sulphate solution (3.5 mL) was added, and the top hexane-rich layer of the biphase solution, containing lipid extract, was removed. Fatty acid methyl esters (FAME) were prepared from the lipid extract according to Christie (1982) with modifications by Chouinard et al. (1999). Briefly, 0.5 M sodium methoxide (40 μL) was added to an aliquot of dried lipid extract (40 mg) redissolved in hexane (2 mL), allowed to react for 15 minutes at 50 °C, and then cooled to room temperature and centrifuged at 1000 rpm for 12 minutes. A 1 μL aliquot of FAME in hexane was removed and injected into a GC for analyses. Chromatographic separation was achieved with a Varian 3300 dual channel chromatograph equipped with dual flame-ionization detectors and hydrogen as carrier gas. Milk FAME were analysed using a BPX70 120 m (ID 0.25 mm, film 0.25 μηι) capillary column (SGE, USA). The injector and detector temperatures were maintained at 240 °C and 280 °C, respectively, with a split ratio of 80 : 1. Initial oven temperature was 80 °C, held for 8 min, followed by two temperature ramps (9 °C/min) to 175 °C and 225 °C, separated by a holding time of 52 min. Injection volume for all samples was 1 μL. Chromatogram peaks were identified by a comparison of the retention times with pure standards of FAME and CLA purchased from Nu-Check Prep (Elysian, Minn, USA). The concentration of each FA was calculated with respect to the internal standard (17:0) and expressed as g FA/100 g fat. Data from the study were subjected to two-way repeated measures of analysis of variance (ANOVA) using the mixed procedure model of SAS Enterprise Guide 5.1. The model included breed effect, number of milk test and interaction effect of breed and test as fixed effects, whereas animal influence within treatments was specified as a random effect. The measured variables obtained at each test (n = 7) during the lactation were regarded as repeated observations of a particular test. Significance was declared at P <0.05. 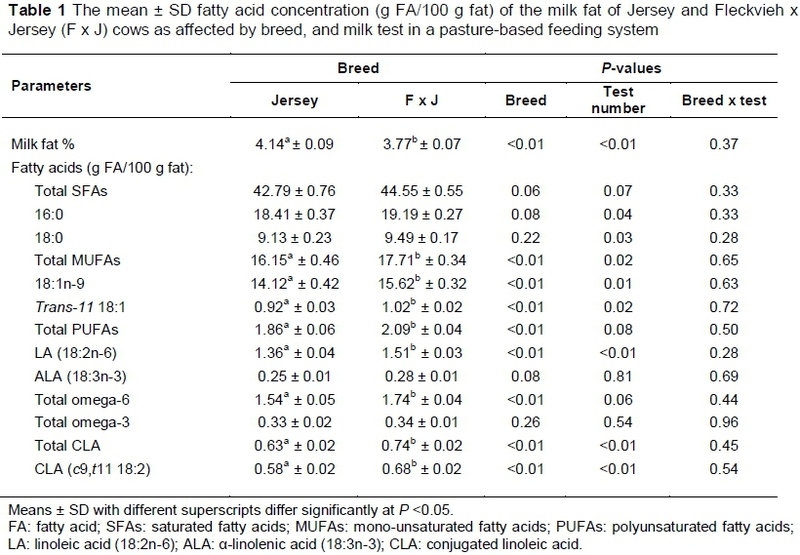 The milk fat and FA levels of the milk of Jersey and F x J cows as affected by breed and milk test (lactation stage) are presented in Table 1, with only the major FAs given in this study. Milk fat percentage was lower (P <0.05) in the F x J breed. Various factors have been suggested to lower milk fat, such as increased PUFA dietary intake decreasing rumen fibre digestion, thereby reducing short chain FA synthesis, as well as decreasing de novo FA synthesis, and suppression of FA synthesis by higher levels of trans 18:1 isomers (Brown et al., 2008). It appears that breeds with a lower milk fat percentage are associated with a healthier milk fat profile in respect of FA composition, that is, lower levels of SFAs and higher polyunsaturated FAs (PUFA) than breeds with a higher milk fat content. In particular, dual-purpose and crossbreds show better FA composition and therefore a more advantageous fat composition than purebreds such as Jersey and Holstein (Samkova et al., 2012). Overall, most FAs differed (P <0.05) between breeds, with the F x J cows showing higher levels in comparison with Jersey cows (Table 1). Although higher in absolute terms, the difference between breeds for 18:3n-3 (α-linolenic acid, ALA) and total omega-3 FA did not differ (P >0.05). The total MUFA and total PUFA levels were higher (P <0.05) for the F x J cows, while the SFAs were increased, although not significantly (P >0.05). The higher MUFA level was due mainly to higher (P <0.05) 18:1n-9 and trans-11 18:1 levels. Maurice-Van Eijnhoven et al. (2011) compared four cattle breed in the Netherlands, showing breed differences, although results were confounded with breed-herd effects as only one breed per farm was sampled. Similar to the present study, Samkova et al. (2012) found that the concentration of 18:1n-9 differed among dairy breeds, that is, Holstein, Jersey, Brown Swiss, Ayrshire and Montbéliarde. However, a study by Zapletal et al. (2009), which compared Montbéliarde and Czech Fleckvieh breeds, showed that total MUFA level did not differ (P >0.05) between these two breeds, possibly because of their genetic closeness, both being Simmental derived. The increase in PUFAs in F x J cows was mainly because of a higher (P <0.05) 18:2n-6 (linoleic acid, LA) level in the omega-6 FA component and not a change in the omega-3 content, as reflected by the relatively minor increase in 18:3n-3. The higher level of total PUFAs in the F x J in this study agrees with results obtained in other studies. Parodi (1999) noted higher levels of PUFAs with cows on pastures, with a similar tendency shown by Grega et al. (2005) and Kraft et al. (2003). Zapletal et al. (2009) found similar results, although their study focused on comparing beef breeds, Montbéliarde and Czech Fleckvieh. Total CLA was higher (P <0.05) in the milk of F x J in comparison with Jersey cows. This is mostly owing to an increase (P <0.05) in the main CLA isomer, c9,t11 18:2, being 0.58 ± 0.02 and 0.68 ± 0.02 for c9,t11 and 0.63 ± 0.02 and 0.74 ± 0.02 g FA/100 g fat for total CLA content in the milk of Jersey and F x J dairy cows, respectively. Both precursors for CLA synthesis, 18:2n-6 (P <0.05) and trans-11 18:1 (P <0.05), were at higher levels in the milk of F x J cows compared with Jersey cows, resulting in higher total CLA levels in the F x J cows. Grega et al. (2005) found that percentages of CLA in the total FA content of Simmental milk was the highest at 69% when compared with other breeds, that is, Black and White, Red and White and Polish Red. CLA was also found to be higher in Montbéliarde, a Simmental-derived breed, on pasture, compared with Normande, Holstein, Jersey, Ayrshire, Brown-Swiss and Guernsey (Hennessy et al., 2007). This confirms the implication that crossbreeding with Fleckvieh could carry over the inherent ability for increased CLA synthesis. CLA can also be formed from 18:3n-3 (Samkova et al., 2012), although the contribution in the present study is probably much lower considering the high level of 18:2n-6. The effect of lactation stage on the mono-unsaturated fatty acid (MUFA), 18:2n-6, 18:3n-3, trans-11 18:1 and total CLA concentrations in the milk fat of Jersey and F x J cows in a pasture-based feeding system is presented in Figures 1 to 5. The major individual MUFAs (18:1n-9 and trans-11 18:1) showed the same pattern in early lactation as for total MUFA with higher (P <0.05) levels in F x J milk compared with Jersey cow milk at specific points over the lactation period. Subrt et al. (2006) reported that higher levels of total MUFAs could be associated with the ability of the breeds and cattle genotypes to deposit intramuscularly adipose tissue. Samkova et al. (2012) similarly found an increasing trend for various breeds, that is, Holstein, Jersey, Brown Swiss, Ayrshire and Montbéliarde, with higher FA from early to the end of the lactation period. The same trend for total PUFAs was observed as for total MUFAs. However, milk test or lactation stage did not affect the PUFA content. The interaction between breed and lactation stage for PUFA concentration was not significantly affected (P >0.05) either. Lactation stage did not affect the total omega-3 and the 18:3n-3 concentration. Total omega-3 and 18:3n-3 FA levels initially tended to be slightly higher in the F x J compared with Jersey cows. Total omega-6 followed the same pattern as total PUFAs, but lactation stage did not differ (P >0.05), with 18:2n-6 following the same trend with higher levels at the end of the lactation stage. Schroeder et al. (2005) showed higher 18:2n-6 levels when the lactation stage was compared with Holstein dairy breeds on pastures. These results are similar to the current study. Findings from Samkova et al. (2012) with regards to 18:2n-6 showed that not much effect was observed with lactation stage with cows on pastures. Milk test or lactation stage affected (P <0.05) the total CLA and c9,t11, as the total CLA concentration of Jersey and F x J cows increased by 28% and 45%, respectively, from early to late lactation stage. In the Jersey and F x J cows, increases in total CLA and the c9,t11 CLA isomers tended to follow similar trends, with an increase from early lactation stage to the end of the lactation stage, with higher levels in the crossbred, ranging from 0.57 ± 0.04 to 0.85 ± 0.03 g FA/100 g fat and for purebred, ranging from 0.57 ± 0.06 to 0.71 ± 0.05 g FA/100 g fat. Concentrations of both 18:2n-6 and trans-11 18:1, precursors for CLA, were higher in the F x J in comparison to Jersey cows, while 18:3n-3 concentration, considered an alternate precursor, was higher only in the F x J cows in early lactation. This resulted in higher total CLA levels in the F x J in comparison to Jersey cows. Similar effects of lactation stage were observed by Samkova et al. (2012) in that higher levels of CLA occur during mid lactation to late lactation, especially in dairy cows on a pasture-based feeding system. Milk content of total CLA in this study was higher in the F x J than in Jersey cows. Overall, the c9,t11 percentage of the total CLA was 92% in Jerseys, while in the F x J the percentage was 93%. This agrees with another study that showed that crossbreeding with Fleckvieh dual-purpose cows resulted in higher levels of CLA (Berry, 2009), probably owing to the inherently higher levels of CLA found in the Fleckvieh breed than in any other dairy breeds. The FA composition of the milk fat of dairy cows is influenced by factors such as breed, diet, lactation stage and seasonal variations. This study confirmed that FA composition is affected to a large degree by breed and lactation stage in a South African pasture-based system. Some FAs differed between Jersey and F x J cows, although not all differences were significant. The current study showed variation in the FA concentration over the lactation period, specifically CLA, with higher levels at the end of the lactation period. Currently, there is no published literature on crossbreeding with Fleckvieh in South Africa and the effect on milk FA composition. As evidenced in the current study, crossbreeding with Fleckvieh holds certain advantages regarding improving the milk fat FA composition compared with pure Jersey cows. Possible reasons for these differences can be ascribed to different desaturase activity and genetic polymorphism affecting FA synthesis. Future research on gene identification and genetic polymorphism could contribute to clarifying the influence of genetic variance on milk fat and FA biosynthesis. The authors express their gratitude to Western Cape Department of Agriculture, Western Cape Agricultural Research Trust and Bayern-Genetik (Germany) for funding this study. The milkers at the dairy who collected milk samples are also thanked for their efforts.